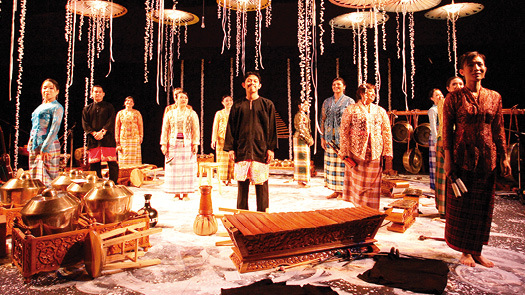 Rhythm in Bronze is a concert and theatre gamelan ensemble which is dedicated to the performance of new music for the Malaysian gamelan and began as an all women gamelan group in 1997 by composer and ethnomusicologist Sunetra Fernando. It continues to make waves by pioneering and spearheading totally new dimensions of gamelan performances. Rhythm in Bronze has brought the gamelan to the contemporary concert stage and developed a new audience for its music with diverse creative collaborations: between the ensemble and Malay,Javanese and Balinese gamelan, Carnatic music, Chinese drumming and percussion, Malay and Sufi poetry. It has release a CD called Rhythm in Bronze – New Music for the Malaysian Gamelan and recently collaborated with Kevin Field, Associate Conductor of the Malaysian Philharmonic Orchestra (MPO) and Roland Peelman of The Song Company from Australia. The group’s latest performance, MaYa: Gong Illusions, received the “Best Production Value” award at the 9th BOH Cameronian Arts Award 2012.